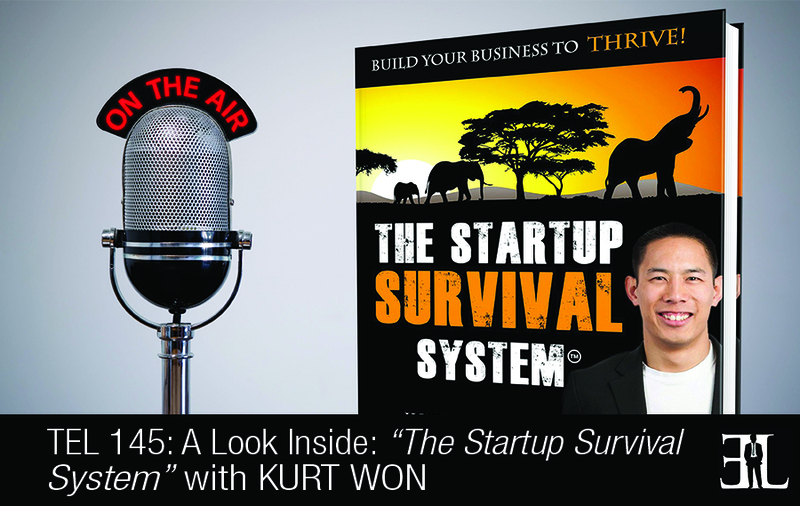 In this episode Kurt Won reveals all the insights on his book, The Startup Survival System, where he shares how a startup can thrive in the first 2 years of business. In his book Won gives you a simple systematic approach to prioritizing your business, narrowing your focus, and increasing your results to ultimately keep your business from failing too early. The goal of the book is to help you prepare for the consequences of entrepreneurship, build a foundation for your startup, improve operations, drive more sales, and maximize profitability. This book is perfect for entrepreneurs who are ready to launch a new startup company and need an easy, actionable guide to help them get started. The Startup Survival System is a very easy read and I’ve made it fun with very simple language for the reader to understand. I think the biggest difference that sets it apart is that I use survival in the wilderness as a metaphor for surviving as a startup which I think helps engage the reader throughout the book. Because this book is a very simple read I suggest the reader read through the entire thing. I found that the more you read this book and answers the questions I give you the more you’ll get out of the book. I would really want the reader to take action on the 5 C’s to complete confidence which I introduce in the book. This is a framework that having worked with so many people I have found really works. Learning this framework will allow you to help others on your team but also in your life to build their confidence which helps them to increase their productivity and also helps your business. Just imagine that you are stuck in the wilderness all by yourself and without any tools. If this were really the case more than likely the first thing you would do is look for shelter or build shelter for yourself. I think this is also one of the things you need to do as a startup at the beginning. And chapter one is all about exploring ways for you to protect your business. When you are starting up a business at some point you are going to experience some testing times and any entrepreneur can attest to that. And those times will test your spirit and also push you to the brink of nearly quitting your business. And so chapter two is really about getting clarity on where you are in your business and your bigger purpose other than making money. Because when the times are tough the thing that’s going to keep you in your business and doing what you are supposed to do is having a personal mission. And so in chapter two I will ask you questions to help you gain clarity on your purpose, your mission, and what’s really driving your desire to start a business or stay in business. If I take you back into the wilderness, once you set up your shelter you need to find fresh water and fresh food to give you the energy to survive and find your way out. In business you need sales and cash flow to sustain all of the operations that happen on a day to day basis. In chapter three I share with you tips and also a proven process to help you to increase your sales more quickly and also make more money. In chapter four we explore what to do in order to keep predators away from stealing your ideas, sales, and intellectual property. You will see that protecting your ideas can really help you create long-term wealth. If you are in a position right now where you have a very unique product or service that you don’t want people to steal than this chapter is really for you. Once you protect your ideas you move on to chapter five which is called Surviving the Storm. I titled it that because no matter how things are going you are going to get the good times and also the bad times. In this chapter I share with you tips and strategies on how to deal with those rough times. Chapter six is about what I call Tribal Survival. This chapter is about look at who is on your team, who you need to get on your team, and how to become and better leader. Chapter seven is about taking the time to really look at the big picture and what all you have achieved. In chapter eight I explore how to leave tracks for new customers to find you. I help the reader to get clear on how to establish the branding and also your marketing strategy. Chapter nine will really help you to gain insights on how to put systems around your processes so it’s easy for you and your team to replicate the success that you’re having. In chapter ten we look at the finance side. What happens to your money when it comes in to your business? Do you put some of that money away or does all of it get spent? In this chapter I help you to get clarity to better engage with your money flow on a weekly basis and ensure that you don’t get caught in what I call a cash trap. In the final chapter I talk about the need to build a business in such a way that allows you to extract yourself from the business if you choose to do so. I was born and raised in South African and have been living over in the UK for the past 15 years. I am a multi award winning consultant for startups and small business owners. I am a speaker and now I’m an author. I’ve worked with over 1,000 entrepreneurs and business owners across 15 different countries to help increase sales and drive results in their business in a much quicker time. My mission is to be able to help empower and support as many startups and existing small business owners as possible. Over the past five years I have worked with over 1,000 entrepreneurs and small business owners and I found that there are really so many people I can help with the amount of time that I have. I knew that writing this book would be a great way to help serve more people and make a bigger impact and help more startups survive and thrive in their first years of business.